Dave Newsham pipped his Speedworks team-mate Ollie Jackson in the greasy conditions of free practice one at Brands Hatch. Basked in glorious autumn sunshine the Grand Prix circuit was drying throughout the session as the morning sun continued to burn off the heavy overnight precipitation. The two Toyota Avensis drivers ran well throughout, however, and were regularly in the top six during the ever-changing conditions. Both left it late to set a final flyer and crossed the line to go one-two in the dying moments. Sam Tordoff’s MG and Aron Smith’s Ford Focus set the third and fourth fastest times respectively, whilst Smith’s team-mate Tom Onslow-Cole rounded out a fresh looking top five. Jake Hill performed sensationally on his NGTC debut and was even quickest at one stage in the Exocet Racing Audi A4. The Kent teenager flew around the daunting GP circuit as if he’d been driving a top-level touring car his whole life but settled for an impressive sixth at the finish. Mat Jackson confirmed Airwaves Racing’s pace with its three drivers in the top seven, whilst Matt Neal’s was the first of the championship contenders on the timesheets down in eighth. 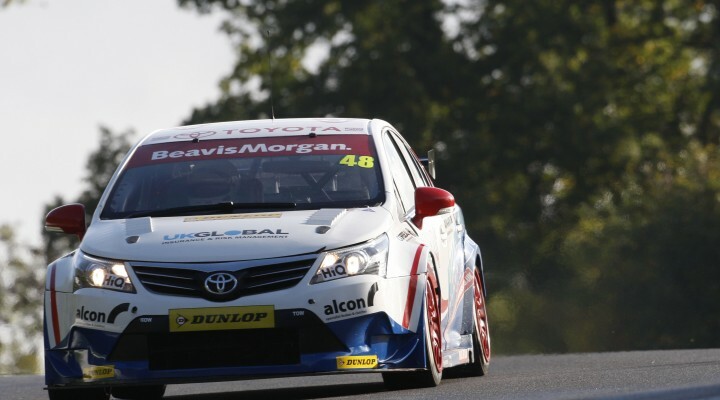 Neal’s team-mate and reigning champion Gordon Shedden was ninth ahead of the Ciceley Avensis of Adam Morgan. Andrew Jordan, Colin Turkington and Jason Plato were all notable absentees from the top ten. The championship-challenging trio were 14th, 16th and 24th respectively. The session was briefly halted to retrieve the Dynojet Toyota of Frank Wrathall from the gravel at Clearways.